This promises to be a very exciting summer with multiple Operations Research conferences on the horizon. There are even others and I wish that my supernetwork team could present at all of them. The first one at which we will have a paper is the MSOM 207 Conference at the UNC Kenan-Flager Business School, which should be a lovely venue. MSOM stands for Manufacturing & Service Operations Management. The conference will take place June 20-21 and the full program is now online. At the MSOM conference, we will be presenting our latest research on sustainability: A Competitive Multiperiod Supply Chain Network Model with Freight Carriers and Green Technology Investment Option. Dr. Sara Saberi of the Foisie School of Business at WPI will present this paper, which is co-authored with Professor Jose M. Cruz of UConn's School of Business, Professor Joe Sarkis, the Head of Sara's Department and also one of the most highly cited researchers in 2016, and me. We had the pleasure of hosting Professor Sarkis at the Isenberg School of Management through the UMass Amherst INFORMS Speakers Series. He gave a fabulous talk on greening the supply chain. Sara received her PhD in Management Science from the Isenberg School in 2016 and Jose did so in 2004. I was honored to chair their doctoral dissertation committees. Shortly thereafter, I will be off to Europe, first to speak at the EURO HOpe Conference, which is organized by the EURO Group on Humanitarian Logistics and the Vienna University of Economics and Business, with Professor Tina Wakolbinger, also an Isenberg PhD alumna in Management Science, class of 2007. At this conference, I will present the paper, A Generalized Nash Equilibrium Network Model for Post-Disaster Humanitarian Relief, which I co-authored with Emilio Alvarez Flores and Professor Ceren Soylu, and which was published in Transportation Research E 95: (2016), pp 1-18. Emilio graduated with honors from the Isenberg School in 2016. Then it will be time to travel to Greece, where I have co-organized the 3rd Dynamics of Disasters conference with my super colleagues: Professors Ilias S. Kotsireas of the Wilfrid University in Canada, Panos M. Pardalos of the University of Florida, and Fuad Aleskerov of the National Reearch University Higher School of Economics in Russia. We are putting the final touches on the program but you can see the exciting talk topics here. Framework for Humanitarian Organizations in Disaster Relief: Effective Product Delivery Under Competition for Financial Funds. This paper is joint work with Professor Patrizia Daniele of the University of Catania in Italy, my long-time collaborator and also member of the Supernetwork Center team, Emilio Alvarez Flores, and Patrizia's student, Valeria Caruso. It will be fabulous to see these collaborators at an exotic venue. I will also deliver the paper, A Multitiered Supply Chain Network Equilibrium Model for Disaster Relief with Capacitated Freight Service Provision. Then it will be back to Massachusetts and before you know it, it will be time to go to the IFORS Conference in Quebec City, Canada. There we will have two papers for presentation. The first paper, A Game Theory Model for Freight Service Provision Security Investments for High-Value Cargo, is co-authored with Shivani Shukla, who recently successfully defended her PhD in Management Science at the Isenberg School, Professor Sara Saberi, mentioned above, and also Professor Ladimer S. Nagurney, who will present the paper. The second paper is on our recent work on blood supply chains with Professor Amir H. Masoumi of Manhattan College and Professor Min Yu of the University of Portland in Oregon. 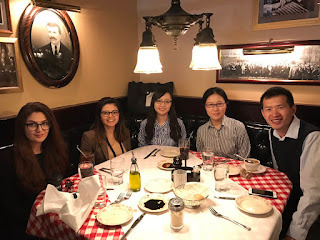 They also were my former PhD students at the Isenberg School of Management and it is wonderful to continue our collaborations on perishable product supply chains and healthcare! For those, interested, you can find the titles and abstracts of my former PhD students' (more recent ones) doctoral dissertations on the Supernetwork Center site. Graduations and accompanying celebrations for 2017 are now over but the joyousness of these special occasions lingers. In the past few weeks other special events have included multiple PhD dissertation defenses, a dissertation proposal defense, and an undergraduate honors thesis defense. Tomorrow I have another PhD dissertation defense and then it will be over with defenses for a while. I chaired two of the five committees and was a committee member for the others. With the above momentous happenings and, since also it is the end of the year, as a faculty member, I thought it fitting to write on the very special thank you notes that I have received from graduating students, present students, and even from some of their family members. One favorite message came via Twitter from a student I taught years ago, and it said: "@Supernetworks - Thank you for making a difference in so many lives." Nothing makes a faculty member happier than getting feedback on one's impact. The above "Thank you" I will always treasure. The same goes for the lovely note cards that I received, some of which are in the photo above. In one of them a student wrote: "If it weren't for you, I would not be where I am today, and for the future. Your 597LG class (Humanitarian Logistics and Healthcare) will always be the most influential class that directed my path for my future.... I've learned and thought about ideas more than I ever have, truly pushing the boundaries of research. .. You've taught me to be fearless, and to succeed in face of challenge." A message from another student stated: "You have really encouraged my love for supply chains and logistics. You serve as a role model for me not only for all that you have accomplished, but how you represent yourself as a women in the industry." This, Madam, could not have been possible without your able guidance & the opportunities & conducive environment provided by you and the University... My daughter's achievement is therefore dedicated to you, Madam, & I would like to thank you for all your efforts in bringing her to this higher pedestal of learning." On dreary days, I will look again at the Thank You notes to remind myself of the truly special role that we as university faculty have. The memories of the students and how deeply they enriched my life will never leave me. They are all part of my academic family! And just yesterday, I wrote and mailed 3 Thank You cards to a colleague, a former student, and to a relative! 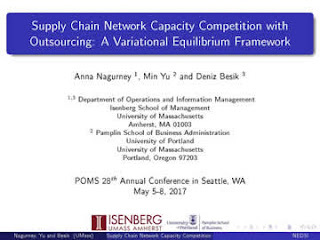 This year the Production and Operations Management Society (POMS) conference took place May 5-8, 2017, in fabulous Seattle, Washington. The conference happened to overlap, in part, with the Illicit Supply Network Workshop, sponsored by the National Science Foundation, at the University of Texas Austin, and I was already committed to the workshop. 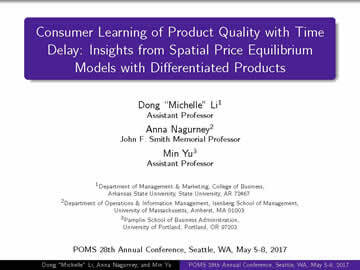 However, I still managed to have two papers of ours presented at POMS: one by my doctoral student, Deniz Besik, and the other by my former Isenberg School PhD student, Dr. Dong "Michelle" Li, now an award-winning Professor at Arkansas State University. The full presentations of these two talks can be downloaded from the Supernetwork Center site. Also, although I could not be there, one of my recent books, Competing on Supply Chain Quality, co-authored with Michelle Li, and published by Springer, was on display at the conference. Plus, so many of my former doctoral students, now all very successful professors, were also at POMS, including Professor June Dong of SUNY Oswego, standing below with Professor Min Yu of the University of Portland. It is special how the members of the Supernetwork Center Team at the Isenberg School of Management continue to collaborate and support one another. 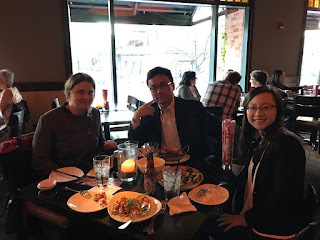 Below in the first photo are Supernetwork Center Associates Professors Min Yu and Michelle Li with former Supernetwork Center Associate (and also my former Isenberg School PhD student) Professor Fuminori Toyasaki of York University. 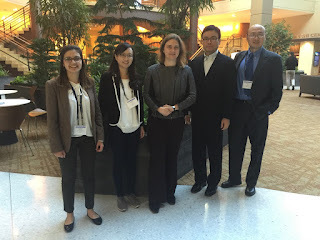 Deniz, Michelle, and Fuminori, are joined by Professor Tina Wakolbinger of the Vienna University of Economics and Business and Professor Zugang "Leo" Liu of Penn State Hazleton in the second photo below. Tina and Leo also serve as Supernetwork Associates. And at conferences we get together for a delicious meal whenever we can. 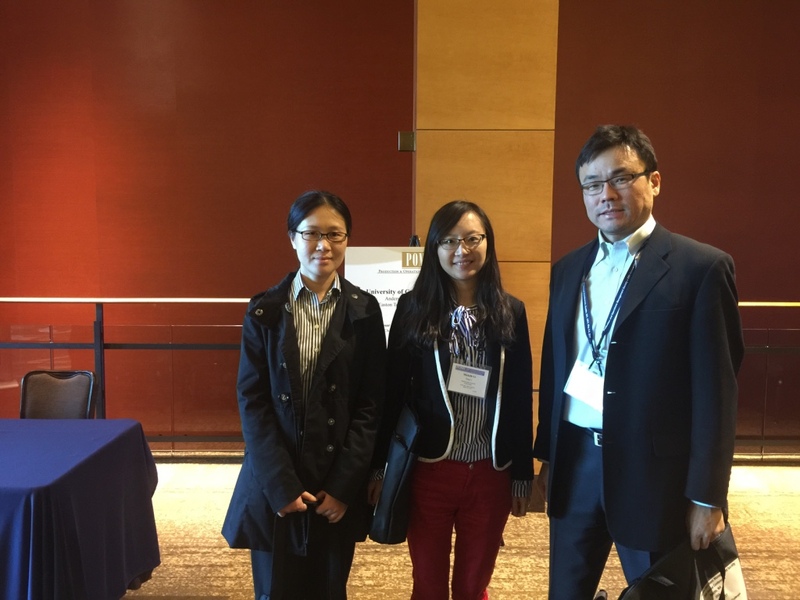 Below in the photo are Professors Tina Wakolbinger, Fuminori Toyasaki, and Michelle Li. 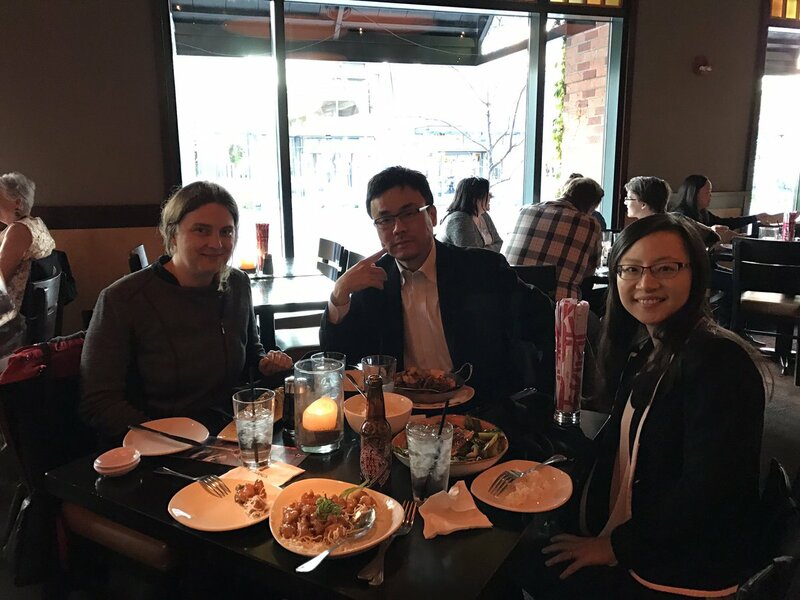 Joining Deniz Besik, Professors Michelle Li and Min Yu in the photo above are Professor Heng Chen, an Isenberg School PhD alumnus, now a Professor at the University of Nebraska, and a friend of Deniz's from Northeastern University. You can search the POMS conference program to find all the fascinating papers presented by the Supernetwork Center Associates on topics ranging from humanitarian logistics to supply chain competition to supplier risk management and robustness analysis, to name just a few! I could not be at the POMS conference in Seattle but many close members of my academic family were. And this summer, some of us will reconvene at various conferences, from the Dynamics of Disasters conference that I co-organized with Professors Ilias Kotsireas of Wilfrid Laurier University and Professor Panos M. Pardalos of the University of Florida, which will take place in Kalamata, Greece, to the IFORS conference in Quebec City. And even before these, I will see Professor Tina Wakolbinger at a conference that she is organizing in Vienna on humanitarian logistics! Yesterday was a truly marvelous day with the Isenberg School of Management (ISOM) commencement at the Mullins Center. This is a special ceremony in which each of the ISOM graduating senior undergraduates receiving their degree, gets their name called, receives a medal, and gets recognized by our fabulous Dean, Dr. Mark A. Fuller, and our exceptional Undergraduate Associate Dean Dr. Linda Shea. Faculty from the graduate's department (and we have 7) then shake hands and often also share hugs. It is a day to remember. Wonderful speeches by our Deans as well as an uplifting video on our school's namesake, Mr. Gene Isenberg, added to the special ceremony. I very much enjoyed being a faculty marshal with my Sports Management colleague, and our Director of Diversity, Dr. Nefertiti Walker. We were all led by Mr. Lou Wigdor, who carried the Isenberg School banner. I could not resist taking the photo of my Operations and Information Management (OIM) colleagues below after we had shaken our OIM graduates' hands. Also recognized at the ceremony were our student leaders and award recipients, including the Jack Welch Scholar from the Marketing Department, Elizabeth Miranda Imbrogna, and Karen Li, an OIM major and premed, whom I had nominated for the 21st Century Leaders Award. Karen was one of ten recipients of the 21st Century Leaders Award from the entire UMass Amherst undergrad graduating class of over 5,000! The day before Karen was recognized at the UMass Amherst graduation and sat on the podium with our Chancellor and other dignitaries, including Senator Elizabeth Warren, who gave a tremendous speech. And, on Friday evening, my husband and I took part in a very special commencement celebration at the UMass Amherst Campus Center honoring the 21st Century Leader Award recipients and the Jack Welch Scholars as well as the jazz legend, Sheila Jordan, the honorary degree recipient. Above is Karen Li receiving her award from the UMass Amherst Chancellor Kumble Subbaswamy and Provost Katherine E. Newman as well as the Vice Chancellor for Student Affairs and Campus Life, Dr. Enku Gelaye. Michaella Morzuch, President of the UMass Amherst Alumni Association, was the excellent moderator and emcee who announced the award recipients. 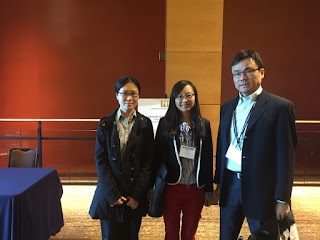 I have written about Karen Li and her accomplishments before, including her 100 page honors thesis, which she defended at the Undergraduate Research Conference on April 28. It was so special to celebrate this occasion even with the Amherst Fire Chief Mr. Tim Nelson, who Karen had interviewed for her thesis. He also graciously hosted a tour of the North Amherst Fire Station last year for the students in my Humanitarian Logistics and Healthcare class that Karen was in. Joining us in the photo below are Dean Mark A. Fuller and Associate Dean of the College of Engineering, my marvelous collaborator on two National Science Foundation grants, Dr. Tilman Wolf. Three generations of Karen's family celebrated with us. The food and lovely evening all those in attendance will never forget. I also had a chance to meet the commencement student speaker, Conor Janes O'Kelly from Ipswich, whose moving tribute to his father, who would always leave him a note in his lunchbox on the first day of school, was heartfelt. Below is a photo of Conor and his Dad at the commencement celebration dinner. We wish all of the class of 2017 much happiness and professional success! With 21st Century Leaders such as these, lucky are those who are faculty at the Isenberg School of Management and UMass Amherst! What a glorious time of the year this is with college graduations in the beautiful month of May! Today the Graduate Commencement at UMass Amherst was held with more than 1,800 graduate degrees awarded to graduates from 60 different countries. I had the pleasure of robing my 19th PhD student, Dr. Sara Saberi (my 20th, Shivani Shukla, had defended her doctoral dissertation just this past Wednesday, so it has been a thrilling week). Dr. Saberi successfully defended her doctoral dissertation last August and marched in the procession today. She has completed her first year as an Assistant Professor at the Foisie School of Business at the Worcester Polytechnic Institute (WPI) in Massachusetts. It is terrific to have her "close by." Her husband, who also has a PhD, and is an expert in food science, graciously brought us bouquets of red roses. The processional to the Mullins Center, where the awarding of degrees took place this morning, started a few minutes late - after 9:00AM, but it was worth it. There was music and marvelous speeches by UMass President Marty Meehan and UMass Amherst Chancellor Kumble Subbaswamy. First, the recipients of the Master's degrees received their degrees and then it was time for the PhD recipients. UMass Amherst started a very nice tradition a few years back of having the doctoral dissertation advisor "hood" the PhD recipient. Sara and I had fun taking a selfie. It was also very special that Dr. Tilman Wolf, who was the PI on the large Future Internet Architecture (FIA) NSF grant, that I was a Co-PI on, and which also supported Sara for two years, was recognized at the commencement with a Distinguished Mentorship Award! A reception followed and it was wonderful to see the support from Sara, including from Shivani Shukla and one of my PhD students, Pritha Dutta. At the reception, we had a chance to also chat with other colleagues from the Isenberg School of Management, as well as degree recipients, supporters, and family members. Yesterday evening, the Isenberg School of Management held a special robing ceremony for our PhD recipients. The PhD program is under the directorship of Dr. George Milne. The Isenberg School presented the PhDs with the beautiful maroon and black robes that they got to wear this morning! Each advisor was to speak no more than 3 minutes about his/her PhD recipient. Sara was stuck on the Amtrak for an hour between Springfield and Northampton, traveling from New Jersey, and missed the event. I spoke about her many achievements as a doctoral student, including receiving the Isenberg School, Outstanding Doctoral Student Researcher Award and the Isenberg Scholar Award, not just once, but twice. The photo below was taken by one of my doctoral students, Deniz Besik. A big congratulations to such an outstanding cohort of Isenberg PhD recipients! Sara now has 2 PhDs: one in Industrial Engineering, and the other one in Management, with a focus on Management Science! So she should be addressed as : Dr. Dr. Sara Saberi! Yesterday, was a special day - my 20th PhD student, whose dissertation committee I chaired, successfully defended her doctoral dissertation at the Isenberg School of Management. Given that Sunday is also Mother's Day it was also the best present for an Academic Mom! Shivani Shukla successfully defended her dissertation in Management Science entitled: Game Theory for Security Investments in Cyber and Supply Chain Networks. Her committee included: Professor Adams Steven of my department, Professor Hari Balasubramanian of the Department of Mechanical and Industrial Engineering at UMass Amherst, and Professor Eric Gonzales of the Department of Civil and Environmental Engineering at UMass Amherst. Shivani's co-authored research has been published in such top journals as the European Journal of Operations Research, the Annals of Operations Research, and Transportation Research E, as well as in a book chapter in the book, Computation, Cryptography, and Network Security, published by Springer. She gave an hour presentation on her thesis, which is 200 pages, and then the audience, and, subsequently, committee members, asked her questions. It was a pleasure to sign off on her thesis, which she has worked hard on. She even taught multiple courses this year, including one online, while being on the job market and interviewing. Yes, doctoral studies certainly prepare one for life as an academic, in which we juggle multiple tasks and roles and are expected to excel in the areas of: research, teaching, and service. 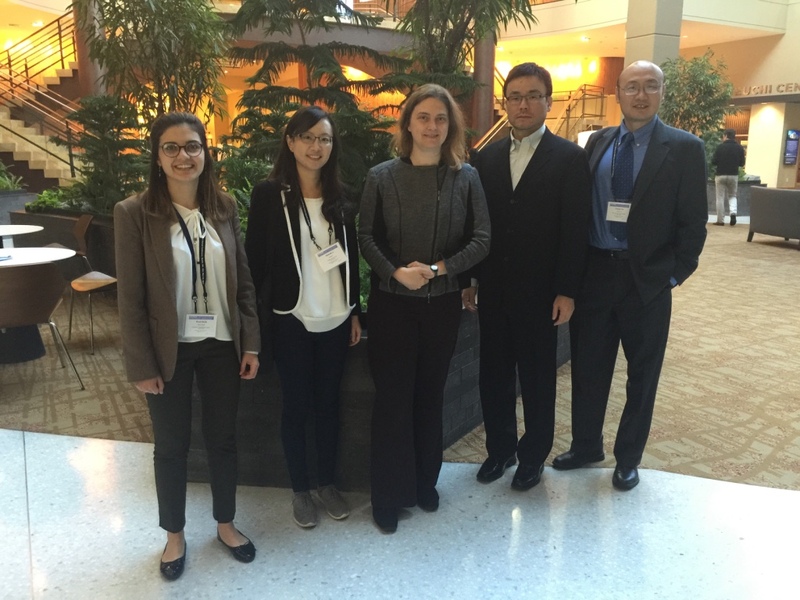 She also served as President of our award-winning UMass Amherst INFORMS Student Chapter. Even though it was during final exams, she had a great turnout of supporters, including fellow doctoral students. Some had already left before we took the photo below. We were all very excited to see Dr. Shivani Shukla open the box! 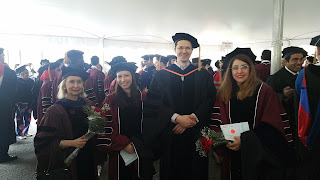 Then I posed with Shivani and my other doctoral students. Off to lunch we marched, my treat, to Judie's, which is a fabulous restaurant in downtown Amherst, known especially for its popovers. It was very special because all committee members could also attend and I thank them for their service and collegiality and also support of Shivani. We were so busy talking and enjoying the lunch that I did not take any photo! Afterwards, I treated the ladies to dessert at Henion - chocolate covered walnut balls - heavenly! And, early this morning, I received the loveliest message from Shivani's father in India, which stated, in part: In India any achievement of an individualistic nature, be it in academics, Philosophy, literature , Music or spiritualism is always invariably dedicated to "Guru"(literally meaning destroyer of darkness, source of enlightenment, -The Master) & the "Shishya" (The student) considers this achievement as the blessings from the "Guru", which eventually empowers her to embark upon a new journey seeking even greater heights in her chosen field ... I would like to thank you for all your efforts in bringing her to this higher pedestal of learning. Is there any profession more rewarding, energizing, or inspiring than academia?! I honestly cannot think of one. I am also a Mom and was thrilled receive a great Mother's Day card (early!) from my daughter who is now enrolled in a doctoral program in STEM and that also makes me very happy! 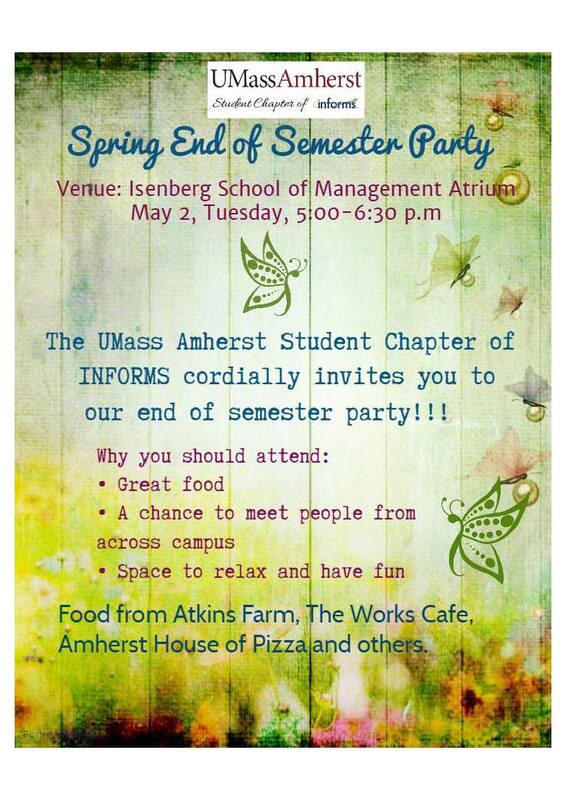 Celebrating a Fabulous Year for the UMass Amherst INFORMS Student Chapter! 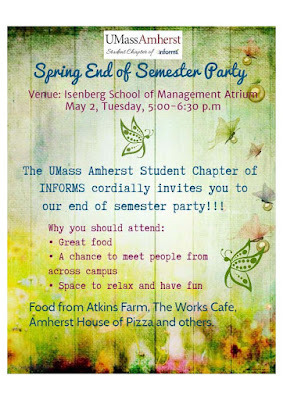 Last week we had our end of the semester (also academic year) UMass Amherst INFORMS Student Chapter party. It took place in the lovely Isenberg School of Management atrium. This was a very special year for the student chapter. Not only was a new website launched, multiple speakers hosted (including Dr. Chaitra Gopalappa of UMass Amherst, Dr. Joe Sarkis of WPI, who brought some of his students, Dr. Ozlem Ergun of Northeastern University, who also brought a group of her students from Northeastern University, Basilio Gentile from ETH in Zurich, Switzerland), a panel organized, a service trip participated in at the Amherst Survival Center, and a tune-up for the annual INFORMS conference organized, but the students even hosted an extremely successful STEM Slam at UMass Amherst. Last Tuesday was the last teaching day of the academic year (and on Thursday I would be heading to an NSF workshop at the University of Texas Austin on Disrupting Illicit Supply Networks). That was also our party day and, as is the tradition, I brought pierogies, kielbasy, and desserts and the students, who are logistics superstars, added many delicious dishes. It was extremely important to recognize the hard-working, incredible Chapter Officers: this year's President, Pritha Dutta, the Vice President and Webmaster (and designer) Ekin Koker, the Treasurer, Deniz Besik, Destenie Nock, Secretary, who also was the fabulous emcee at the STEM Slam, Rodrgo Mercado, the Communication Director, and Amro El-Adle, our event coordinator. These officers were recognized with award certificates. The food was delicious at the party. The terrific fellowship of students and faculty, whose passion is Operations Research and the Management Sciences, made for a very warm and special event. 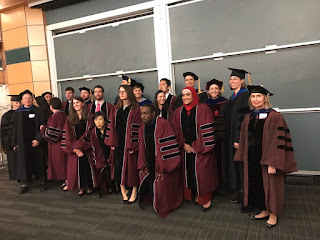 Even several of the students in my Humanitarian Logistics and Healthcare class came as did Karen Li, my undergraduate student who is receiving the UMass Amherst 21st Century Leaders Award in ceremonies at graduation this Friday! She is only one out of ten recipients of this award from a graduating class of 4,000! And, yes, I nominated her. The students also presented me with a framed certificate and a letter in a lovely note card that was very touching and so appreciated. Thanks to the Chapter Officers and chapter members for a fabulous year! It is so special serving as the Faculty Advisor of this student chapter. 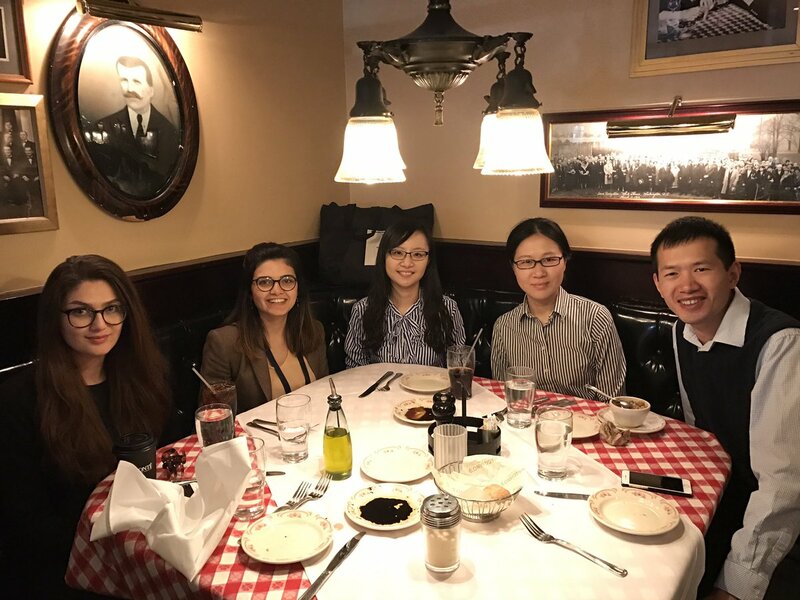 The success of the chapter's alums speaks volumes about how this chapter enriches lives, builds camaraderie, and enhances professional experiences for students.